It seems we can’t get enough of lush green rainforest plants. We want them cascading down bookcases, sitting cutely on coffee tables and stretching gracefully towards our ceilings. But we struggle to keep the little beauties alive. Hundreds of thousands of dollars’ worth of gorgeous greenery is getting composted each year after it finally gives up the ghost, leaving small armies of wannabe growers to carry their guilt like a secret Nickelback fan club membership. It’s not just the money, it’s the effort, not to mention your hopes and dreams for an Insta-perfect indoor plant oasis. Architect and interior designer Jason Chongue is known as ‘the plant whisperer’ and has a huge following on Instagram, where he shares shots of his inner-city pad, packed to the rafters with plants. In his home live more than 400 plants, many of them rare and notoriously tricky. But the truth is, not only has he loved gardening since he was a child, he has killed lots of plants in his quest to understand them. “Some indoor plants wouldn’t work in my apartment because of the light. Others I’ve killed by over-caring for them,” he admits. Remember too that it’s not one single factor that will keep a plant happy, but the combined effect of them all. And some — such as soil, watering and humidity — are very closely related. When it comes to plant maintenance, many factors contribute to keeping them alive. Let’s have a look at some of your main considerations. There is quite an art to finding the right position with the right light for each plant. Jason also stresses the importance of adjusting their position as the sun moves between winter and summer. In the shoulder seasons, Jason treats some of his plants to a spell outdoors. “I sometimes put plants out in autumn or spring but never in summer or winter. It’s too extreme,” says the Melbourne resident. Plants need to be gently introduced to the brighter light and different conditions outdoors. Find a shady protected spot and gradually introduce them to light shade. This might surprise you, but watering probably accounts for more plant deaths than any other single issue, and overwatering is a more common cause of death than underwatering. Like offering a friend a drink, it’s a good idea to ask the plant first. Check each week how dry the soil is by testing it with your finger. Wiggle it down to the second joint. If the soil is dry, water it. If it’s wet, leave well alone. If it’s just moist, check it again in a couple of days. “People get stuck in a routine — say watering every two weeks in winter — and then keep the same regime in summer, when plants need more water,” Jason says. Other factors will affect how thirsty a plant gets, such as the humidity of the room and how fast-draining the potting mix is. Also, be aware that you can water plants by pouring directly onto the soil (preferably under the leaves) or by putting the whole pot in a bucket of water, allowing it to soak up from the bottom. Soaking is a great way to ensure the soil is fully watered, but every so often it’s important to water from above to flush out any waterborne salts, which will build up over time. Pour the water until it flows out of the bottom of the pot, but make sure you then empty out any water still sitting in the saucer/outer pot after half an hour, otherwise you risk rotting the roots. The sweet spot for each plant is different, so it pays to do a bit of research on watering. Unlike rainforest plants, some desert plants need to dry out between watering. Use room temperature water. Even better, let it stand for a day or so to remove any chlorine from it. Soil can become hydrophobic which means it repels water. This Gardening Australia clip shows a good way to check. Spring cleaning your plants is important — and do this in autumn, too. Plants can’t ‘breathe’ if the tiny holes in their leaves get blocked by dust, so they need to be wiped off with a wet cloth every so often (it’s officially called ‘transpiration’, but you know what we mean). However, don’t try this with hairy-leaved plants — they generally don’t like water sitting around on their leaves (which you need to remember when watering them, too). Like any living organism, plants need to keep their nutrients up to grow and thrive. Carbon, hydrogen and oxygen is taken from air and water. Nitrogen to make chlorophyll, phosphorus for growth, potassium to regulate water loss, plus calcium and other minerals all generally come from the soil. As the plant processes the minerals in the potting mix, these will eventually run out, and you, dear grower, need to replace them. You can do this with slow-release fertiliser (refreshed every spring) or with liquid feed (applied in weak doses every 2-3 months through the growing season), or by replacing the potting mix. Regular checks while you’re watering will keep you alert to pests or nasties moving into your turf. You need to nip problems early on to stop them spreading. Gardening Australia has a fact sheet on the most likely pests. By keeping plants happy, you reduce the risk of attack because healthy plants are more resistant. That ties in all the other maintenance elements of humid air, a good airflow, and adequate food and water. If a plant outgrows its pot or the soil becomes exhausted, a repotting session is called for. 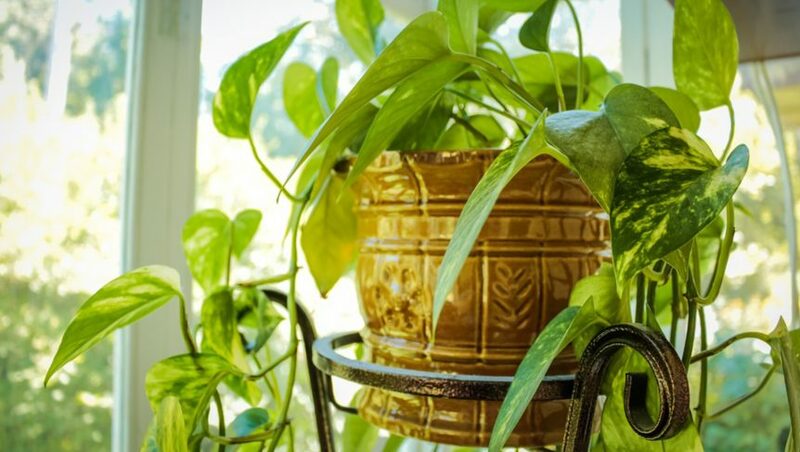 Get a new or freshly cleaned pot that is just one size up from the existing one — don’t go too big or the plant will be swamped and not be able to dry out the soil between watering. Also treat your plant to the best potting mix you can afford. Then gently prise the plant from its pot (outside if possible as this is messy) and loosen any roots that have started matting around the edges. If it’s really pot-bound, you might have to cut off any roots that have started circling, and run a knife down the outside of the root ball to encourage new roots to grow (all with a super clean knife, of course). Then put a few handfuls of mix in the new pot, hold the plant in place on top (the soil level should be 2-3cm below the rim — remove some mix if it’s too high) and when you’re happy with its position, backfill around the plants’ roots with more potting mix. Gently bounce the pot two or three times to get the mix to settle, rather than pushing it down hard with your fingers. When finished, water it in well with a weak dose of seaweed solution to help reduce transplant shock. Looking after house plants need not be a chore. Check them over for browning leaves (which can be snipped off), pests or other problems. If they’re doing well, look for offsets or longer vines that could be used as cuttings to grow new plants.